How do you create the Cloud Pod Architecture? Make sure you are on Horizon View 7 (or Version 6 if you want to manage all via a command line tool). Check out Carl Stallhoods fantastic blog post on this topic. 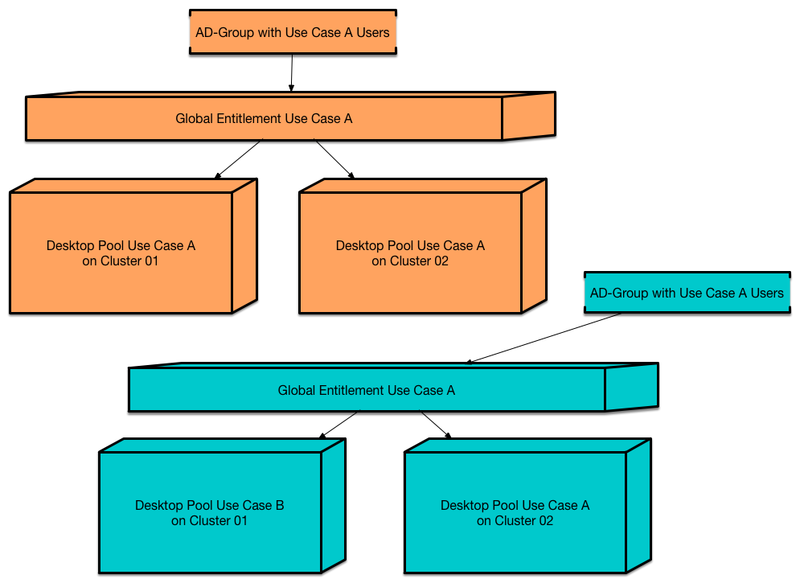 There are some requirements for the pools that you are able to add them to a global entitlement. For example the Pools must have in some setting identical criteria. If you want to add a local Pool to the Global entitlement and you end up not seeing this pool…. … you won’t get many information why nothing is showing up. So either manually compare all the pool settings…..
……. ORRRRR use the good old lmvutil (that was used in the first days of the Cloud Pod Architecture) to add a local pool to the global entitlement. Figure out the relevant namens/ids and execute the correct command in CMD on one of your Connection Server. The answer message will give us the concrete reason why no pool can be added to the specified entitlement. We have different User-Reset policies defined in the pools. …. and live with the flexibility of Global Entitlements.